Have you read much in the mainstream press about the Millennium Development Goals to reduce extreme global poverty, hunger and disease by 2015? What about coverage of the U.S. government's failure for almost a decade to meet its pledged contributions to help achieve these goals? And have you recently read any comprehensive press accounts about the effect of the economic collapse on the level of poverty in our own country and abroad? Or for that matter, how much did you see in the press about U.S. poverty prior to the collapse? Professor Jeffrey D. Sachs, director of The Earth Institute at Columbia University and special adviser to United Nations Secretary-General Ban Ki-moon on the Millennium Development Goals, says the answer to all of these questions would be: Not very much. Sachs sees both global and domestic poverty as urgent issues that need more in-depth attention from the mainstream press – and, more importantly, action from the White House and Congress – as poor people here and abroad face even worse situations because of the worldwide economic recession that is adding to their already tragic lives. And, warned Sachs, the national security of the United States and other western countries is enhanced not by military invasions and occupations of impoverished countries, but through development assistance that deals with the extreme poverty that nurtures violence and terrorism in those nations. 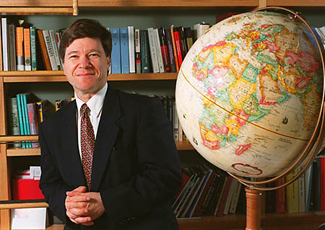 Among the few exceptions that he sees on global poverty in the daily press, Sachs said, are New York Times op-ed columnist Nicholas Kristof, who regularly writes about suffering people in poor nations, and Times South African reporter Celia W. Dugger who writes frequent poverty-related stories about Africa. One of the few journalists focused on domestic poverty, he said, is op-ed columnist Bob Herbert of the Times. Typically, Sachs said, press stories on extreme poverty in, for example, sub-Saharan Africa, describe an immediate crisis such as food shortages exacerbated by aridity and environmental degradation, civil war or other forms of violence and lawlessness. These stories report the suffering of villagers, discuss emergency assistance coming in through relief agencies, and quote an aid official or two and someone from the United Nations on the unfolding tragedy of that particular country. Good stories, as far as they go – but usually short on long-term solutions. "In these impoverished countries, when we encounter a problem viewed as threatening to the United States" and other western nations, "the talk immediately turns to sanctions, or military solutions, or peacekeepers" and warnings of terrorism threats, Sachs told Nieman Watchdog. Sustainable development assistance to combat the poverty that underlies terrorism "seldom gets discussed." Yet, said Sachs, it is joint efforts by the world's wealthiest nations to fight extreme global poverty – as well as deal with climate change, environmental degradation, and population growth – that can provide real security for the United States and other nations of the world. Civil war and outside military interventions, such as in Iraq and Afghanistan, hurt the countries where they are carried out and also build greater resentment and threats of terrorism against the United States. "That story" – the ingredient for true U.S. national security being non-military development assistance to impoverished countries, and not invasions of those countries – "almost never gets reported in the press," Sachs said. A good example, Sachs said, is the widespread coverage over the last year of the Somalian pirates who have attacked international ships in and around the Gulf of Aden and held them and their crews for ransom. That story, he said, presented the perfect opportunity for the press to talk about the underlying causes of the lawlessness – "the terrible conditions of life there," including extreme poverty, hunger, the aridity of the land, etc. – and the need for stepped-up, long-term international aid for sustainable development. Instead, "the talk was all about military solutions." The same, he said, is true of violence-ridden Darfur, in western Sudan, which Sachs has described as "the development backwater of an impoverished country." Reducing those suffering from hunger and poverty by half. Ensuring all boys and girls a full course of primary schooling, and eliminating gender disparity in primary and secondary education. Reducing by two-thirds the mortality rate for children under five, and reducing by three-fourths the maternal mortality rate. Halting and beginning to reverse the spread of HIV/AIDS and other diseases. Integrating the principles of sustainable development into country policies and practices. Developing open, non-discriminatory trading and financial systems. In his 2008 book, "Common Wealth: Economics for A Crowded Planet," Sachs wrote that 15 percent of the world's population lives in what can be classified as extreme poverty, with these poorest of the poor living in countries that share certain negative characteristics such as beihg "landlocked, tropical, drought-prone, malaria-ridden, and off the world's main trade routes." As a point of comparison, Sachs noted that in 2005 the United States had per capita income roughly 20 times larger than that of the world's poorest region, sub-Saharan Africa. Many of the sub-Saharan countries are much worse off than the region as a whole: For example, according to CIA World Factbook statistics, the United States in 2008 had per capita income 235 times higher than Zimbabwe, 156 times higher than Democratic Republic of the Congo, and 78 times higher than Somalia. So extreme are conditions there, Sachs wrote, that for the last generation "sub-Saharan Africa has failed to achieve a rise in income per person." Vital to the success of attaining the Millennium Development Goals is the financial assistance of the United States and other wealthy nations. As the End Poverty 2015 Millennium Campaign put it: "...(I)t is absolutely critical that rich countries deliver on their end of the bargain with more and more effective aid, more sustainable debt relief and fairer trade rules, well in advance of 2015." In testimony at Senate Foreign Relations Committee hearings on foreign aid and development last July, Sachs faulted the U.S. government's official development assistance (ODA) program for being "too poorly directed, too small in scale, and too fragmented to play the role it should." Currently, Sachs noted, U.S. development assistance stands at around a "far too low" 0.20 percent of the U.S. gross domestic product (GDP) – about $26 billion in 2008 – considerably less that what this country has pledged. The United States is committed, as a signatory to the March 2002 Monterrey Consensus, in the words of that agreement, to "make concrete efforts toward the international target of 0.7 percent of GNP as official development assistance." Sachs urged the United States to take prompt action to meet this 0.7 target figure – which could produce an annual U.S. contribution of around $90 billion – to help poor countries further with sustainable agriculture, health, education and business development. In sheer dollar amounts, the United States is the largest ODA donor, but it is near the bottom among the wealthy nations in donations as a percentage of GNP. By this measure, Sweden and Norway contribute five times more than the United States. Other countries that have met the 0.7 standard in recent years include Luxembourg, the Netherlands and Denmark. Overall, donor countries are contributing only 0.3 percent of their combined incomes in development assistance. But as of late, with the world battered by recession, progress toward achieving the Millennium Development Goals has been seriously lagging. Indicative of the dire global poverty to be overcome is the latest depressing hunger report, "The State of Food Insecurity in the World 2009," jointly published in October 2009 by the Food and Agriculture Organization of the United Nations (FAO) and the World Food Programme (WFP). The two organizations reported an historic high of 1.02 billion people worldwide – one of every 6.7 people – who are undernourished and suffering from chronic hunger. The recent rise in the number of hungry people was attributed to the "combination of food and economic crises" that has hit underdeveloped countries the hardest. Broken down by regions, the report estimated 642 million chronically hungry people in Asia and the Pacific; 265 million in sub-Saharan Africa; 53 million in Latin America and the Caribbean; 42 million in the Near East and North Africa; and 15 million in developed countries. The U.N.-WFP report named 31 countries "currently in crisis requiring external assistance," including 14 in which wars or civil conflicts were being waged, or recovered from. Among these were Afghanistan and Iraq, where the United States has been waging war since 2001 and 2003, respectively. "Progress toward the goals is now threatened by sluggish – or even negative -- economic growth, diminished resources, fewer trade opportunities for developing countries, and possible reductions in aid flows from donor nations. At the same time, the effects of climate change are becoming increasingly apparent, with a potentially devastating impact on countries rich and poor." The report did note some encouraging, but slow, progress in women's political representation, and declines in child mortality and birth rates, and strong progress in increasing the numbers of people with access to safe drinking water. Following on this, the U.N.'s Millennium Development Goal Gap Task Force warned in a September report that the Group of Eight (G8) industrialized countries were a whopping $35 billion per year short on their 2005 pledge to meet the poverty-fighting goals. This figure included "a $20 billion annual shortfall on commitments to Africa," the U.N. News Service reported. Despite the reports of slow progress and even regression in some areas, Sachs in a September statement pointed to certain improvements in global health as "one of the most important accomplishments" since 2001, while adding there is still a long way to go. He noted that "malaria is now falling sharply throughout Africa because in the last 2-1/2 years about 200 million bed nets have been distributed," and measles deaths are down by more than 90 percent. Bed nets have been a favorite point of comparison for Sachs, who has noted that one day’s worth of Pentagon spending would provide enough funds to ensure antimalarial bed net protection for every sleeping site in Africa for five years. To pay for increased U.S. financial support for the Millennium Development Goals, Sachs told Nieman Watchdog he would like to see "as much money as possible" redirected to that effort from the U.S. military budget, which for fiscal year 2010 is projected at $665 billion. Sachs favors the United States withdrawing fully militarily from Iraq and Afghanistan, a move which he said would save $150 billion-$200 billion per year. Additionally, he said he recommends another $100 billion in Pentagon budget cuts for nuclear weapons development and unnecessary weapons systems. Sachs noted in his Senate testimony in July that the U.S. agreed-to target of 0.7 percent of GDP for global poverty-fighting efforts "is almost unknown in the Congress and the American public" but "is deeply embedded in international commitments, at the U.N., G8, and other forums." This "failure to date to acknowledge this international target is a point of continuing weakness of American global leadership." Under the Bush administration, Sachs wrote in "Common Wealth," the MDGs "were met with stony silence and scorn within the corridors of the White House." With a new administration, there is already cause for greater optimism that the country will move toward meeting its Millennium Development Goals obligations, he said. Sachs told Nieman Watchdog that he was heartened by President Obama's speech at the United Nations in September in which he emphasized U.S. recommitment to the MDGs and the importance of a U.N. summit of world leaders, set for next September, at which a final push for achieving the 2015 goals will be made. However, as Sachs noted, this part of Obama's speech drew no headlines and scant mentions in the press, while carrying great weight among global antipoverty campaigners. In brief, here is what Obama said at the U.N.
Next: Poverty in Afghanistan, where the war adds to the misery of some of the people already enduring some of the worst conditions in the world. Enhance education with its associated books, nutrition and pocket money in poor countries (Mexico tries to do that, they are trying to some extent in Afghanistan etc). That cost would be very low and ROI astronomical.